Who must sign and why? 2. The managing agent alone. The legislative rationale behind making it compulsory for two people to sign body corporate instruments and documents, with the exception of levy clearance certificates, is referred to by Professor CG Van der Merwe as the “four-eyes principle”, i.e. that at least two natural persons must subscribe. This principle was introduced to avoid abuse by a single person signing documents to the detriment of the body corporate, as it imposes a check on each trustee’s motivation for signing a particular instrument or document. For example, the “four-eyes principle” may prevent a single trustee who wants to sell his unit from acting in bad faith and signing his own levy clearance certificate, despite the fact that levies for his unit are outstanding. The reason for the managing agent alone being authorised to sign levy clearance certificates is presumably because managing agents are generally independent professionals who have no personal interest in the scheme. However, PMR 5 was amended to make it possible for a managing agent to own a unit in a scheme that he manages and for him to act as a trustee of that scheme. When PMR 5 was amended, PMR 27 should also have been amended to take into account the possibility that a trustee who is also the managing agent of the scheme may act in bad faith and sign his own levy clearance certificate despite outstanding levies on his unit, by disallowing a managing agent to sign a clearance certificate for his own unit. What “instruments” and “documents” must be signed? While the heading of the rule refers to the signing of “instruments”, the text refers to “documents”. Therefore the rule can be interpreted widely to cover all instruments, including negotiable instruments (for example cheques), legal instruments (such as powers of attorney and contracts of employment) as well as all other less formal documents. But the prescribed rules also make other specific provision for the signing of certain body corporate “documents”. PMR 15 makes it clear that any one trustee can give notice of a meeting of trustees. PMR 38 requires that the annual trustee report be signed by the chairman. So, clearly, PMR 27 is not applicable to those documents. But PMRs 53 and 54 require a decision by trustees and written notice to owners for the calling of a special or annual general meeting. Is notice of a general meeting a “document” for the purpose of PMR 27? It is certainly an official communication by the body corporate, and has all the features of a document. The notice should, strictly speaking, be signed in accordance with PMR 27. But, in practice, we see many notices calling body corporate meetings that are not signed by any trustees or by the managing agent. Does this non-compliance with the provisions of PMR 27 invalidate the proceedings of and the decisions taken at the meeting, even if the notice was otherwise properly given? Some would argue so, but we will not know for sure until this question is considered and pronounced upon by a judge. Our view is that a judge or arbitrator would accept that the lack of proper signature is a procedural defect but, before declaring proceedings invalid for want of technical compliance, would want to look deeper into the matter and establish whether due process was in fact followed by the trustees in deciding to call the meeting and setting the agenda, as well as whether any owner was materially prejudiced by the defect. Jennifer Paddock is a sectional title expert. 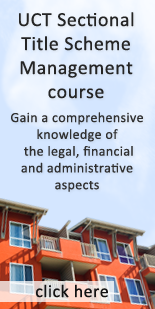 Learn more about the benchmark course in sectional title scheme management, presented by Paddocks in conjunction this the University of Cape Town.